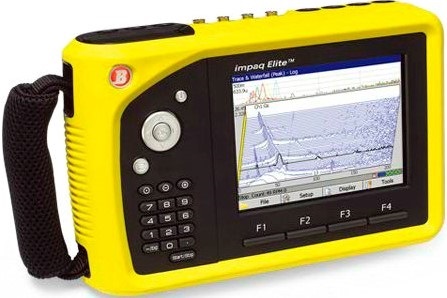 Impaq Elite is a powerful, portable, 4- Channel real time analyzer that is build for advance noise and vibration analysis in the field. It comes with IP 65 rating for measurement in harsh environment. The Impaq Elite is equipped with a large 6.4 inch color VGA(640 X 480) high resolution touch screen. The combination of Microsoft's powerful WINCE operating system and touch screen operation make it very easy and intuitive to use. : 40kHZ, single channel@12800 lines. : Hanning, flattop, rectangular, force, exponential. : Complex spectrum, power spectrum, cross power spectrum, FRF, time waveform, orbit and coherence, waterfall. : Automatic units transform with pre-defined table. : Linear, exponential, time, peak hold. : Single, Harmonic, Harmonic+Single, Peak, Mark Cursor. : Single plane, dual plane, overhung rotor (3 equal weights). : 80 rpm to 300,000 rpm. : Low, normal, high, 0.03, 0.015, 0.008 and 0.004.
: 10, 20, 50 and 100k. : Order trace, order spectrum, and waterfall display. : 6 rpm to 480,00rpm. : 0.5, 0.25, 0.125 and 0.0624.
: User selectable 16 orders plus overall traces. : Adjustable waterfall plot and intensity plot. : RPM cursor and order cursor. : Linear, log, dB, real, image, phase and polar plot. : Full octave, 1/3 octave and 1/12 octave. : 1/3 octave: 10 KHz, 1/12 octave: 5kHz. : Full Octave : 32 kHz, 1/3 octave: 40 kHz, 1/12 octave: 20 kHz. : 1/128, 1/64, 1/32, 1/16, 1/8, 1/4, 1/2, 1, 2, 4.
: Off, External, Input Channels, Manual. : A, C or Flat. : IEC 61260 and 61672.
: Show Waveform and/or Orbit. : Search Train, Machine or Point.